This set carbide tooth provides high wear resistance and toughness when cutting a variety of applications such as: case hardened steels, spring steels, aluminum, high speed steels, nickel based alloys, duplex and heat resistant steels. 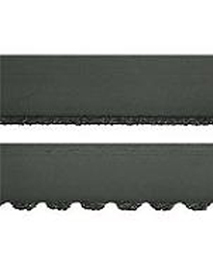 Commonly referred to as a “foundry carbide blade” because of its common usage cutting gates and risers. This set tooth blade is beveled with a straight leading tooth. This design will enable a smooth trouble free cut on all kinds of applications. The positive rake angle allows faster penetration for high production cutting. 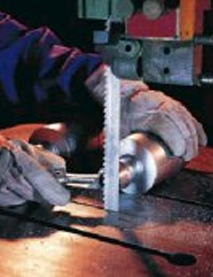 The triple chip carbide blades are the most powerful and productive carbide blades available on the market. Triple chip carbide blades are extremely effective in cutting very hard materials quickly! 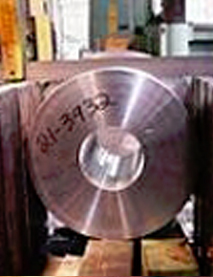 A smooth mirror like finish is also produced when these blades are run correctly. The carbide tip increases wear resistance cutting high temperature alloys. Materials: High nickel alloys, Titanium, Inconnel, Other exotic materials.